Hi Everyone! Welcome to my first Tuesday Testimonial Linking Party. How this works: each Tuesday I will share a new piece of art with Scripture on it along with a few words about what this Scripture means to me or a Testimony of how it has worked in my life. 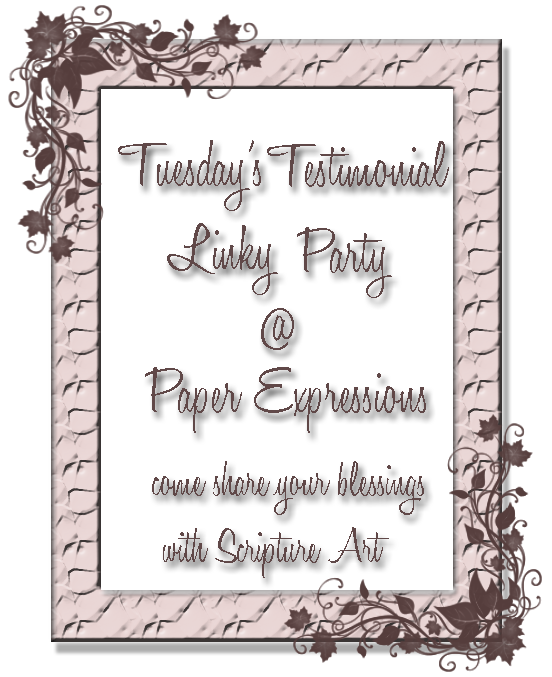 You are then invited to join me by sharing your own piece of Scripture art along with a Testimony, Devotion or a few meaningful words. You can create anything you like: ATC's, Tags, Scrapbook Pages, Cards, Altered Art, Digital Art, etc. You can share something brand-new or an older creation. Just remember to link your creation in the linky tool below and place the Tuesday's Testimonial badge in your post or sidebar. If you do link up, I ask that you take the time to visit one or two other people and share in their blessings. A few weeks ago my Mom had received some not so great news about her health but needed to undergo some medical testing to confirm the diagnosis. The testing itself had it's own risks, not to mention the possible diagnosis. I was quite worried and upset and I called on my friends to lift her up in prayer. God heard and answered those prayers! Mom made it through the testing okay but also did not have what the doctor thought she had. Praise the Lord! I would like to link this up to this week's ODBD Shining Light Challenge: Anything Goes. Some of you have mentioned that you don't own any Scripture stamps. The one I used today is from Our Daily Bread Designs. If you participate in their challenge linked above you could win a $15 gift certificate to their store. They have an awesome collection of Scripture stamps. Also, if you enjoy making Faith based projects, my friend Theresa Calderini over at Parables of a Crafter has a weekly publication call going on for a devotional that she is writing and wants Christian art work to publish with it. So you should definitely check into that. 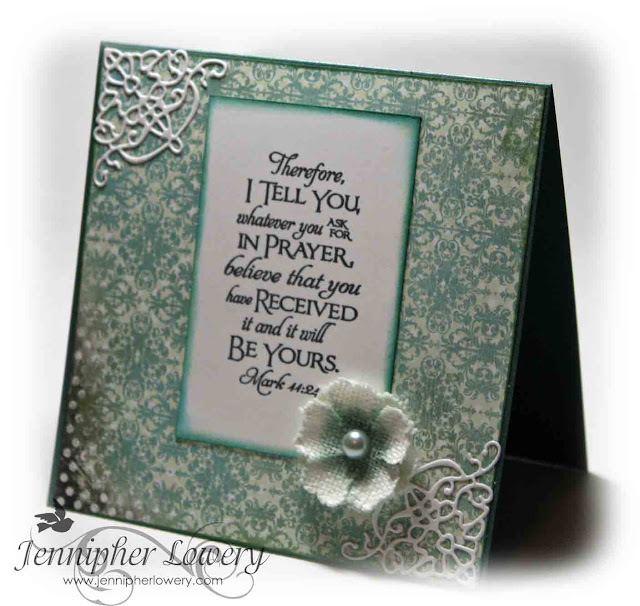 Another faith based challenge I enjoy playing in is Stampin' Sisters In Christ. My card fits their challenge this week to use something new. I used a new Cheery Lynn Die for the decorative corners. Well, that's all for today. Thanks for stopping by. Beautiful card Jennipher. I'm so glad that the news you got about your mom was a relief! What a beautiful card Jennipher! I just love the corners. The corner adornments add such a touch of elegance to this beautiful card! NJ! So glad your prayers were answered with you mom, how scary. Your card is perfect, so lovely with the colors/DP, die and that beautiful flower. 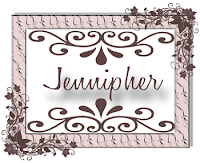 Your card is stunning Jennipher! I absolutely love the corners! Beautiful card Jennipher!! Love the flower and the corners are so elegant. Loved your card. I am so glad that things went well for your mom. I made a card to share for this challenge before work this morning, but I can't figure out how this all works. Beautiful colors! That little flower is adorable! Great verse! So beautiful!! 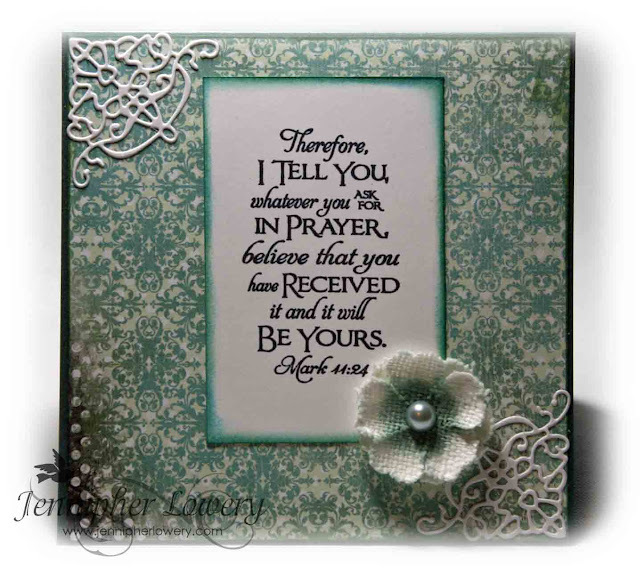 I just love the corners and your colors to frame the scripture!! Thanks for joining the ODBD Shining the Light challenge this week!! What a beautiful card Jennipher I love the verse its stunning , fabulous work well done and I am so glad to read about your mum, it must have been a super relief for you and your family , and of course your mum. Beautiful card, Jennipher! Everything about it! Soooooo very grateful on the good report for your mom. Totally agree with what you wrote: Scripture is the Word of God. We are what it says we are. We can do what it says we can do. We can have what it says we can have. You must have FAITH and believe that you are, you can do, and you can have just what it says. Simply elegant...simply gorgeous! Wonderful testimony as well! Happy that God did answer your prayers (He's amazing!) I may have to play along with this too! I love that you're doing this!! I enjoyed creating the card but to be honest, I more enjoyed the time I had to reconnect with my heavenly Father as a result of this!! I love when crafting and spiritual come together!! 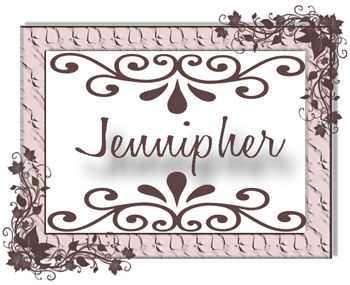 I love the simple elegance of your card Jennipher! When I have some "extra" time I would like to join your linky party.